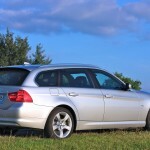 There is no mistaking that we here at BimmerFile are fans of the hatch and even more so the sport wagon, which in some markets is still called “touring”. 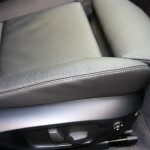 We love them for their increased functionality all while not sacrificing the driving benefits of a sedan. 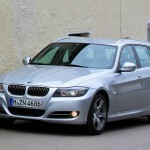 We recently spent time behind the wheel of a 2011 330iT (RWD), equipped with the sport automatic slush box. As a farewell to outgoing models many markets release “Editions”, these special run cars come with a set of special features and equipment that set the last year off from the rest of the production run- enticement to buy a last year model. 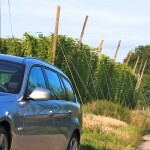 The model we spent several days jaunting around Bavarian hop farms in was of the German persuasion and it was equipped almost how we’d build our own. 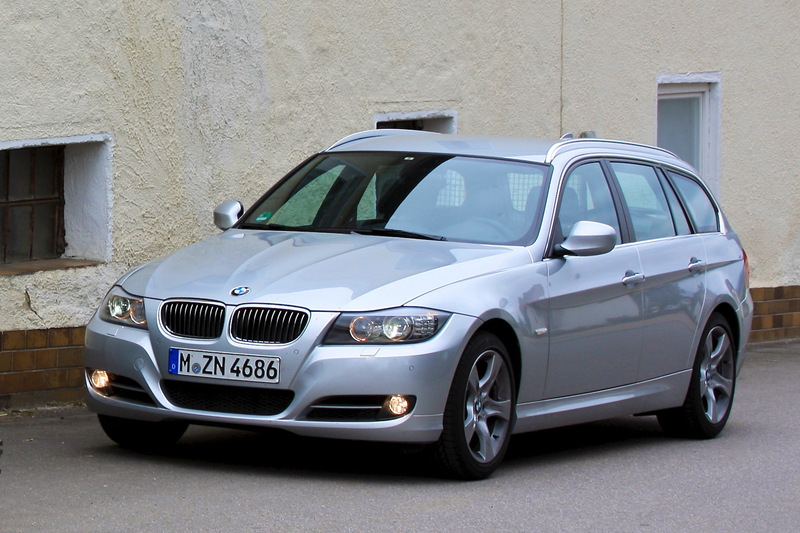 It’s hard to say that any car can get better looking with age, but the 3er wagon (E91) may have done just that. After the refresh the car gained some well needed hood creases and exterior lighting elements that are up to date, if not futuristic. The roof rails have now become more aerodynamic and are offered in aluminum rather than just plain black; making things look a bit more cohesive and upscale (less SAV like). 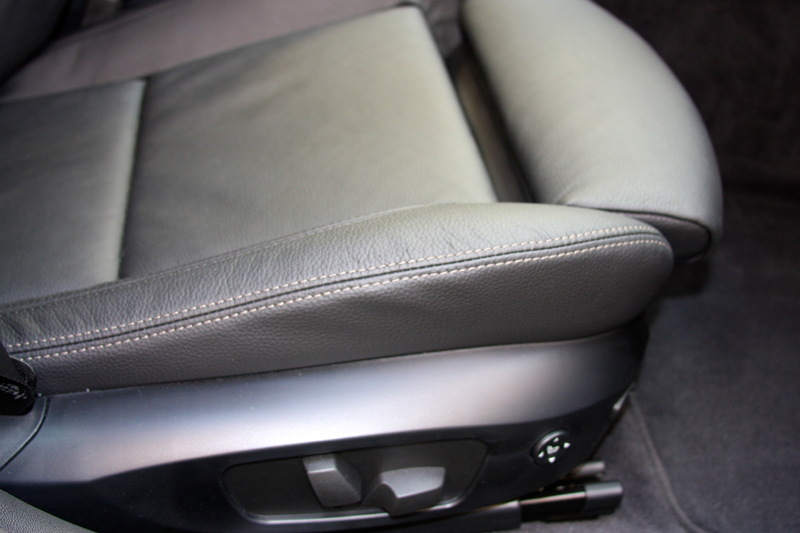 These are significant improvements from the vehicle that launched back in 2005. With the “Edition” package, there are larger exclusive 17″ rims as well as fog lights and a host of other items we take for granted stateside. 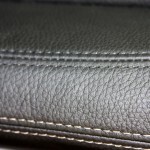 The biggest standout of the package though is the contrast stitching found throughout the interior leatherwork and the anthracite headliner sans sunroof (priceless). 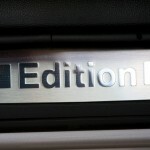 Less impressive are the door sills, stating “Edition”, not sure if those would be considered a plus or not? 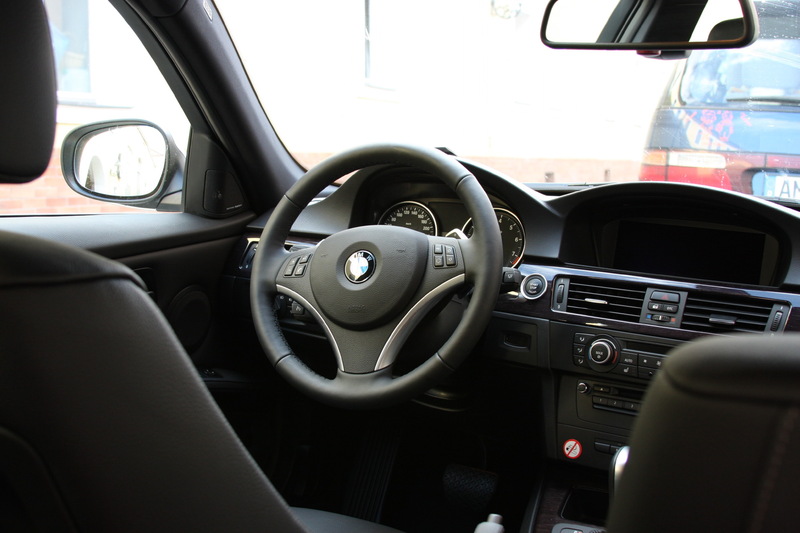 Where the E91 shows its age and its biggest shortcoming in styling is in the dash layout. It still has modern appointments throughout just that there are little things that show how long ago the design was completed. For instance, there is a slot for the key fob even though our car was equipped with Comfort Access and the fob will never see that slot (the comfort access fob has on non-rechargable battery). The dual hump on the dash is no longer needed because of the advances in TFT screen technology, but since we had the latest generation iDrive in our corner we needed the camel dash as well. BMW’s newest offerings forgo the dual humps and leave the screens out on their own. The dash as a whole is less driver centered than we’d like and has been one of our main gripes since the debut of the E9X models and that still remains here. 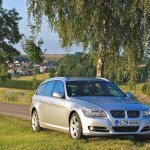 The current 3 Series touring model is all about the drive. It hunkers down in the corners (especially with the equipped sport suspension), is compliant and provides excellent feedback. The suspension is forgiving enough to make long distances fly by, or maybe it is the cars ability to go fast smoothly. Either way, long distance drives are a breeze. While there is more weight in the rear of the touring than its sibling sedan it doesn’t show from behind the wheel. The engineers massaged the suspension to make the drive and handling in both variants behave almost identically. 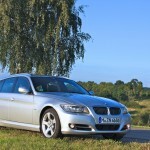 This is unlike the 5 Series where the touring model has air suspension and changes the dynamics considerably. In the US and EU alike the sport wagon/touring can be built with you choice of rear wheel drive or xDrive all wheel drive. Not here to argue the merits of both but to commend BMW for still offering consumers a choice in this segment rather than forcing one or the other upon a buyer. BMW also still offers both a proper 6 speed manual transmission and either a 6 speed automatic or a sport automatic (certain markets) both being steptronic and shiftable. Our car featured the latter and although a manual would be our first choice. These new automatics shift just as quick, allow the converter to fully lock and come equipped, if the option box is checked, with true “pull”/”pull” paddles shifters on the wheel. Engagement aside, these new slush boxes offer fun and sportiness while making dealing with a stau (traffic jam) a breeze. Besides this from being our last dance with a 3 Series wagon for a while (if ever stateside), this review was a way to drive the most powerful naturally aspirated non ///M inline six engine BMW has ever offered. 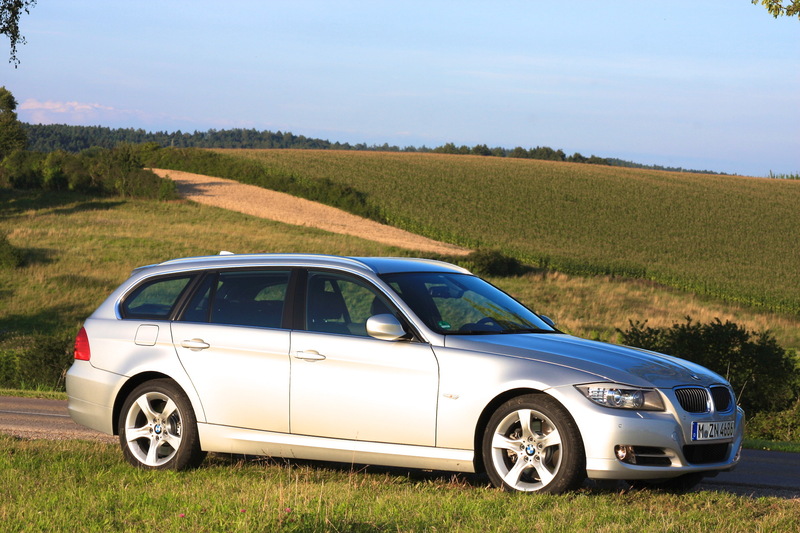 The US saw a single model year run of the N52 based 330i, and it was never offered in a wagon and lacked the direct injection (lean burn) our tester was packing. 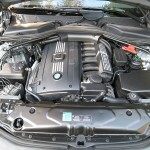 The N53 engine never made it to the US as with BMWNA’s lineup of the 28i and turbo 35i models there was no place for it or, according to some sources, the direct injection system disliked the poor quality of US fuels and it would have been more of a hassle than the improvement in power was worth. Whatever the reason, the US market was excluded from BMW’s plans for a naturally aspirated direct injection six. In typical BMW high revving fashion the N53 produces 275hp at 6700 RPMS just south of the 7000 RPM redline, the torque output of 236 ft·lb is within a peak range of only between 2750 and 3000 RPM. These numbers are the best BMW came to market with in a naturally aspirated six cylinder motor. It revs effortlessly, is as smooth as silk while at the same time being a huge disappointment. Yes, a disappointment. This engine had been previously placed on a mantle at BF. However, now that we’ve spent some time with it, the N53 leaves a lot to be desired whereas the newer turbos do not. The lack of grunt down low, and the need to ring it out to even get 275 hp is difficult to do in day to day commuting. 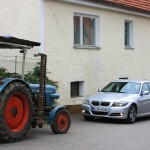 Some will argue that the past ///M motors were not that different in concept. 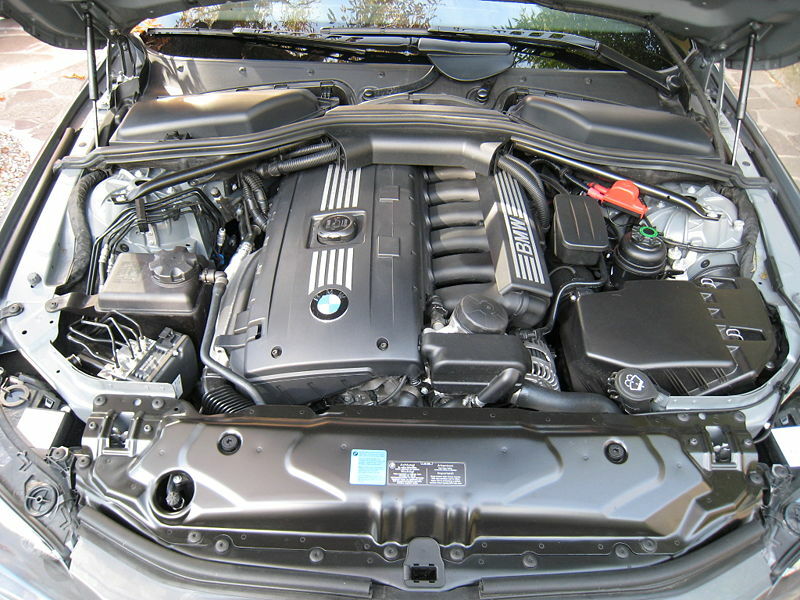 The turbo engines of the N54 and N55 variety provide more fun, and seemingly are more efficient as the N53 does not use Valvetronic and is not being forced fed air. It’s only real benefit to efficiency is direct injection, and that just isn’t enough to compete. In the end, the US did not lose out by getting the N52 in 328 spec for most of the E9Xs run. It provides the same revving and nearly identical response with a bit less power and greater efficiency. As equipped our tester had the large fully functioning Navigation Professional (in some markets a smaller neutered “Business” version is available) with BMW Connected and apps. It had the full arsenal of BMW’s latest and greatest in the world of navigation and accouterments related to that centrally located screen. All these new advances blend the world that used to be relegated to outside the car into it, for better or worse. Email, text messages and the internet in the car was something that was bound to happen as people increasingly fiddle with their phones/devices while driving and in the interest of safety it makes more sense to have the car read such things back than a driver reading a tiny screen. Google search is much the same as in the states; instead of using the database built into the navigation map you can use Google for more up to date information. 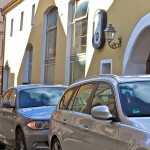 BMW Online, part of BMW Connected is a portal to the internet. A home page with news and information is the first stop. However after clicking through some nannies you have the ability to read local news, weather and stay up on your favorite teams scores. 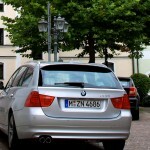 In Germany, the Nav screen will also play DVDs and can receive TV if the car is equipped with a receiver. What the car was lacking was the latest in safety gadgetry. Sure it had a ton of airbags, the alphabet soup of brake technology and adaptive xenons but no lane departure warning, no night vision, no blind spot assistant or the remainder of technology to give bad drivers aids to be safer. Of course these technologies were not available and they have never been added to the E9X platform, but you can expect them on the next generation 3 Series touring (F31). In fact they’ve even made their way to the new F20 1 Series as options. 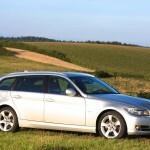 The 3 Series Touring is an ideal all around vehicle. It provides utility while still being fun and engaging to drive aggressively on backroads. It soaks up the miles on the highway and easily keeps family members happy with its space and creature comforts. 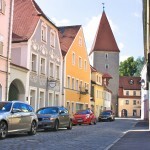 Even though it is an end of life vehicle there are things that resonated throughout our time driving through Bavaria- the chassis, brakes and feel are all BMW and are superb. We can only hope that the influx of electronics (and electronic steering) doesn’t take away from the next generation as those qualities make the car truly exceptional. This model may be the last of the wagons, at least wagons with feel and a functional rear luggage area so enjoy them if you have one. 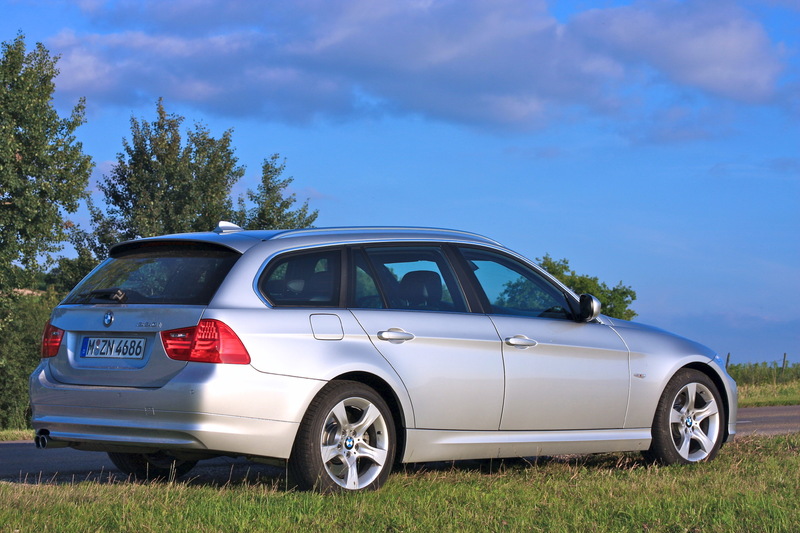 Otherwise kiss them goodbye – the E91 wagon may have been the best all around 3 series BMW has ever built. It may not seem that way at the moment but a few years down the road it will be missed.